This entry was posted on April 29, 2016 by Texas Safety Supply. An average construction worker or an oil field industrial worker that uses Impact Resistant Gloves is not supposed to know everything about PPE Hand safety. Though safety during work hours is a common sense, some workers who have been working for years were never taught the basic lessons on hand safety and Impact Resistant Gloves use. Ignoring the safety on such sites may cause damage to the workers. In this post, we would talk about the safety of the hands. Hands are what a construction worker use the most. Hands are associated with handling the tools and equipment. Bare hands are prone to injuries and accidents. It does not matter how hard you try to keep your hands protected, Impact Resistant Gloves offer hand protection necessary for unexpected situations. Impact gloves are found to handle such situations in the oil fields and construction sites. 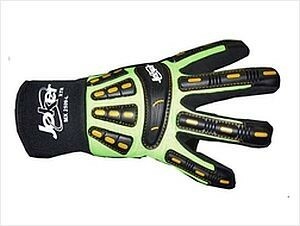 All employees working in the Oil and Gas Industries should be provided with Impact Resistant Gloves. Oil field work includes drilling, extraction of oil from ground, handling tough machines and tools, working all together and pulling rocks. In all such scenarios hands are exposed to different chemicals and substances that can tear the skin and cause damage to bones and muscles. Impact resistant gloves are specifically designed to take the impact of hard forces like accidental rock drops, abrasions with stone pieces. The drilling machine creates a strong vibration that may cause the machine to slip out of the hands and cause an unexpected accident. Impact resistant gloves absorbs the vibrations and offer a tough grip on it so the workers can comfortably handle it for longer period of time. Technology and innovation has improved the quality of impact resistant gloves with several years of evolution. The manufacturers have studied and researched a lot to understand the challenges an oil field worker goes through. The standards are improved and ratings are assigned to various glove types that can be used from light to super tough situations. Multiple layers of protection is embedded in its construction. Usually, a thermo plastic Rubber also known as TPR is molded over the Hi- Performance Spandex to construct Impact resistant Gloves. During the impact force, the substance deals with the spandex and then the TPR. It ultimately saves your hand from impact and injuries. Impact Resistant gloves like MX 2509 Joker XTR Xtreme Impact Oil Field Gloves and Joker MX1187 Winter Oil Field Impact Gloves are quite popular in oil field industries. Construction site owners should help their workers by educating them of various hazards and introducing worktime impact gloves. Maintaining the protection level in the industry would let your workers perform better and remain safe in various accidental situations.